An innovative campus core and data center switch for smart, high performance connectivity. 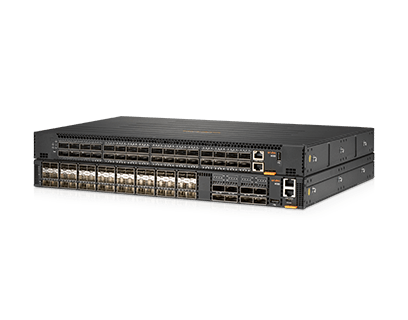 The Aruba 8325 switch series offers game-changing application performance in a compact 1U form factor. Designed for high scale in core and aggregation or Top of Rack (ToR) deployments. Options available support 10/25/40/100 GbE connectivity and front-to-back or back-to-front cooling. The ArubaOS-CX operating system is designed to addresses current and future mobility and IoT demands as well reduce the time spent on manual configuration tasks. By combining a modern, fully programmable OS with the Network Analytics Engine, the 8325 Series provides the industry’s leading and monitoring troubleshooting capabilities. Aruba Network Analytics Engine uses simple scripts to quickly see network health and traffic anomalies. Built-in analytics and troubleshooting tools deliver real-time and historical analysis to help solve problems faster. A full set of REST-based APIs with a built-in Python interpreter allow for easy integration to other systems on-prem or in the cloud. Aruba’s new high availability technology developed specifically for the campus core and aggregation is VSX. This solution brief describes how VSX achieves HA with an always available network. Provides 6.4Tbps for switching and 2,000 Mpps for forwarding. All switching and routing are wire-speed to meet the demands of bandwidth-intensive applications today and in the future. SFP+ ports support an optional 10GBASE-T Transceiver.